The wine world produces wine with a lot of different names that don’t necessarily match up from country to country. Cabernet, Chardonnay and Merlot are considered to be international varietals that may be blended with other wines in different countries and may appear under different names. On this page, over time, I will attempt to provide so common threads and descriptions of the worlds varietals and most common blends that we know by different names. A grape dating back to the 1600s in France and by DNA testing at UC Davis, determined to be a cross between the Cabernet Franc and Sauvignon Blanc grapes. Most suspect that it was an accidental cross pollination, that produced one of the most significant grapes in the world . It is produced in almost every wine producing country in the world today, it stands alone as a Varietal wine grape and as a primary base grape for many of the worlds most recognized wine varieties. It serves as a blending grape in Italy for both Barolo and Barbera in Italy and Rioja in Spain. The ancestors of this international varietal came from the Burgundy region of France as across between an ancient and now nearly extinct variety know as gouais blanc and a member of the pinot family. Although not yet verified, researchers at UC Davis suspect it to be Pinot Noir. It now represent one of the most popular grapes in the world, which may seem odd given the varieties propensity to disease and other maladies. It is also know for being a variety very prone to mutation with somewhere north of 400 know variants. In California we find perhaps the greatest differences in the qualities that make up the wine “Chardonnay” where we find it grown in the mountains, desserts, in the valleys and on the coastal hills an plains, producing a wide cross-section of characteristics from oak, butter, stone fruit, berry, minerality, smoke and tobacco. When the grapes get picked and each of the various terroirs offers a different opportunity to create interesting wines when combined with differing vinting processes and aging vessels. With this particular wine the treatment of the oak barrels can make a huge difference in the wine produced, from oak prominent to fruit forward, the available chardonnays from California Span the globe. Merlot is one of three international varietals and it is believed to be a mutation of the Cabernet grape. I first appears in notable writing under that name in France in the late 1700s. In the modern world , Merlot as a Varietal finds a home principally in France, Italy, United States, Chile, and Australia. You will also find it as a blending wine, with it being known for being the major component of many of the wines we know today as a “Bordeaux”. In addition it finds its way into many wonderful California blended wines. Merlot Grapes appear to be very adaptable as they grow in cool, moderate or warm climates. Accordingly they produce different styles based on their terroir. In France (cooler) the wine is traditionally a bit lighter in color and fruitier, as contrasted with California (warmer) where the wine produced tends to be a deeper in color, more to the a dark burgundy color and have a bolder more acidic character. These short descriptions tend to be over generalized for a more detailed history check out Wikipedia or Vino. 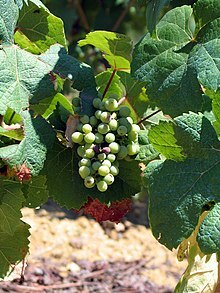 Mourvèdre is a red wine grape with its origins probably in Spain that in many of the wine regions of the world, but principally in France, Spain California, Australia and New Zealand. I am told it gets produced as a varietal wine, but I have only personally tasted it in Rose and GSM (Grenache, Syrah and Mourvedre) blends I am told that it also shows up in “Port Style” wines but I am not aware that I have ever tasted one though I do love Port and Port style wines. Jancis Robinson a noted wine expert contends that Mourvèdre is a very tannic wine that often has earthy notes with soft berry notes. Mourvedre grapes can be problematic to grow as they are very susceptible to vine diseases and powdery mildew which can ruin an entire crop. In addition this particular grape needs a lot of sun and pretty heavy irrigation or rainfall in order to flourish. This variety of wine represents a pretty small part of the worlds wine grape production and as an ancient grape has lost favor with most production wineries. As mentioned in one of my Posts on Screw Caps or Corks, Randall Grahm and him Bonny Doon Winery have played a big part in the development of this grape in the United States. Pinot noir (French: [pino nwaʁ]) is a red wine grape variety of the species Vitis vinifera. The name may also refer to wines created predominantly from Pinot noir grapes. The name is derived from the French words for pine and black; the pine alluding to the grape variety having tightly clustered, pine cone-shaped bunches of fruit. Pinot noir grapes are grown around the world, mostly in the cooler regions, but the grape is chiefly associated with the Burgundy region of France. Other regions that have gained a reputation for Pinot noir include the Willamette Valley of Oregon, the Carneros, Central Coast and Russian River AVAs (American Viticultural Area) of California, the Walker Bay wine region of South Africa, Tasmania and Yarra Valley in Australia and the Central Otago, Martinborough and Marlborough wine regions of New Zealand. Pinot noir is also a primary variety used in sparkling wine production in Champagne and other wine regions. It is widely considered to produce some of the finest wines in the world, but is a difficult variety to cultivate and transform into wine. The grape’s tendency to produce tightly packed clusters makes it susceptible to several viticultural hazards involving rot that require diligent canopy management. The thin-skins and low levels of phenolic compounds lends Pinot to producing mostly lightly colored, medium bodied low tannin wines that can often go through dumb phases with uneven and unpredictable aging. When young, wines made from Pinot noir tend to have red fruit aromas of cherries, raspberries and strawberries. As the wines age, Pinots have the potential to develop vegetal and “barnyard” aromas that can contribute to the complexity of the wine. Editors note: This was excerpted from Wikipedia where you will find a more detailed discussion of this varietal. Viognier is a white wine grape variety. It is the only permitted grape for the French wine Condrieu in the Rhône Valley. Outside of the Rhône, Viognier can be found in regions of North and South America as well as Australia and New Zealand. In some wine regions, the variety is co-fermented with the red wine grape Syrah where it can contribute to the color and bouquet of the wine. Like Chardonnay, Viognier has the potential to produce full-bodied wines with a lush, soft character. In contrast to Chardonnay, the Viognier varietal has more natural aromatics that include notes of peach, pears, violets and minerality. However, these aromatic notes can be easily destroyed by too much exposure to oxygen which makes barrel fermentation a winemaking technique that requires a high level of skill on the part of any winemaker working with this variety. The potential quality of Viognier is also highly dependent on viticultural practices and climate with the grape requiring a long, warm growing season in order to fully ripen but not a climate that is too hot to where the grape develops high levels of sugars and potential alcohol before its aromatic notes can develop. The grape is naturally a low yielding variety which can make it a less economically viable planting for some vineyards. Editors Note: This description is an excerpt from Wikipedia. For a more detailed discussion of this Varietal follow the embedded link. Tannat is a red wine grape, historically grown in South West France in the Madiran AOC, and is now one of the most prominent grapes in Uruguay, where it is considered the “national grape”. It is also grown in Argentina, Australia, Brazil, Peru, South Africa, Bolivia, and in the Italian region of Apulia, where it is used as a blending grape. In the US states of Maryland and Virginia, there are small experimental plantings of the vine, and plantings in California have increased dramatically in the first years of the 21st Century. It also shows great promise in Arizona and Oregon. Tannat wines produced in Uruguay are usually quite different in character from Madiran wines, being lighter in body and lower in tannins. It is also used to make Armagnac and full bodied rosé. In France, efforts to solve the harsh tannic nature of the grape led to the development of the winemaking technique known as micro-oxygenation. Tannat grapes are normally found in the Basque-influenced regions of France near the Pyrénées. The wine is notable for its very high tannin levels and is often blended with Cabernet Sauvignon, Cabernet franc and Fer to soften the astringency and make it more approachable. In addition to Madiran, Tannat is also produced in Irouléguy, Tursan and Béarn, and it is a minor constituent of Cahors wine. Modern winemaking in the region has begun to emphasize the fruit more and use oak aging to help soften the tannins. Now the wines typically spend about 20 months in oak prior to release. The Tannat vine was introduced to Uruguay by Basque settlers, especially Pascual Harriague, in the 19th century. Along with the Manseng vine it quickly started to flourish in its new home. Today it is often blended with Pinot noir and Merlot and is made in a variety of styles including those reminiscent of Port and Beaujolais. From Uruguay the vine spread to Argentina and from there flying winemakers promoted the grape’s resurgence in California at the end of the 20th century. Plantings of Tannat (also known in Uruguay as Harriague) have been increasing in Uruguay each year as that country’s wine industry develops. The Tannat wines produced here are characterized by more elegant and softer tannins and blackberry fruit notes. 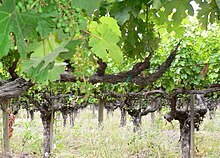 Vineyards in Uruguay have begun to distinguish between the “old vines” that are descendants from the original cuttings brought over from Europe and the new clones being produced today. The newer vines tend to produce more powerful wines with higher alcohol levels but less acidity and complex fruit characteristics. Some wineries use both vines to make blends. The grape is also blended with more well known ones such as Merlot to make excellent alternatives to California and Australian offerings. 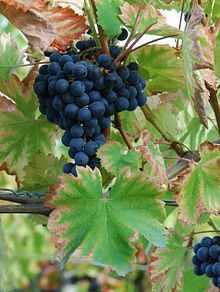 In the late 19th century, University of California-Berkeley agriculture professor Eugene W. Hilgard imported the Tannat vine from Southwest France and began to grow it in the University’s vineyards. The grape did not receive much attention until the late 20th century, when South American varietals of the grape variety began to receive international acclaim. In the 1990s several plantings began to appear in California in the Paso Robles and Santa Cruz Mountains AVAs with such producers as Bonny Doon Vineyard using it in blends with Cabernet Franc and Tablas Creek Vineyard, Joseph Swan, and Kaz Winery selling it as a stand-alone varietal. In northern California, Westwood Estate Wines planted their vines in the late ’90’s and they produce either a blended or varietal Tannat. Other Californian wine producers began using it in blends and also with their Sangiovese and Syrah wines. 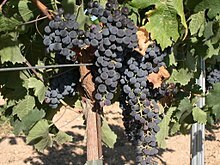 Vineyards in Texas, Arizona, Oregon, Maryland and Virginia began sourcing cuttings from California. In 2002, the Bureau of Alcohol, Tobacco, Firearms and Explosives approved Tablas Creek Vineyard’s petition to add Tannat to the list of grape varieties that could be made into a varietal wine. By 2005, Tannat acreage in California had increased to 140 acres (57 ha). ^ Jump up to: a b Clarke, Oz (2001). Encyclopedia of Grapes. Harcourt Books. p. 241. ISBN 0-15-100714-4. ^ Jump up to: a b Robinson, J., ed. (2006). The Oxford Companion to Wine (Third ed.). Oxford University Press. p. 679. ISBN 0-19-860990-6. Jump up ^ Robinson, J. (1986). Vines, Grapes & Wines. Mitchell Beazley. pp. 203–204. ISBN 1-85732-999-6. Jump up ^ Robinson, J., ed. (2006). The Oxford Companion to Wine (Third ed.). Oxford University Press. p. 442. ISBN 0-19-860990-6. Editor’s Note: This material was libeally excerpted from Wikipedia as I found it very accurate and there was little that I could add of value except editing for presentation. So I don’t want to sound dumb but I am pretty new at this wine thing. Are wine blends made from hybrid grapes or a variety of different grapes? Or are they a mix of different wines after the fermentation process is complete?